The 8260A is the most sophisticated monitoring solution for recording studios, post-production houses, digital mastering facilities, radio and TV broadcasting. 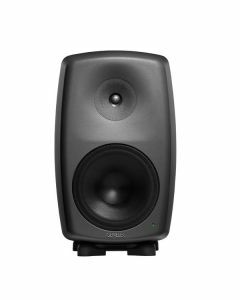 The 8260A combines outstanding three-way monitor design with Genelec state of the art AutoCal™ and Genelec Loudspeaker Manager (GLM™) control network technologies. GLM allows to automatically align every monitor on the network in terms of level, timing, and equalisation of room response anomalies. Together with the 8260A breakthrough MDC driver design, Genelec MDE™ and advanced DCW™ technologies provide accurate imaging and outstanding clarity and definition of the inner details of the music.